Born from the legacy of our most iconic surf pack, Cyclone II, we've built out an entire line of Cyclone packs and bags built around premium materials like waterproof Cordura® fabrics, and technical performance for your daily session or your most epic board trip. 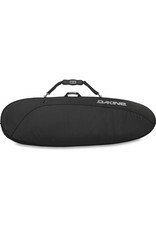 Now we've combined the versatile functionality of an all-purpose bag with the uncompromising performance of our Cyclone line, to create the Cyclone Hybrid Surfboard Bag. With generous dimensions, this bag is designed to accommodate wider retro and fish shapes, and it comes in 4 sizes—all built with 8mm foam padding for the ideal fit and protection of your unique skiff. And this bag is loaded with features, from its heat-reflective Silver Energy Shield Lite and vented design, which keeps your board cool in the midday sun, to reflective logos for added visibility in the dark, to the semi-dry splash proof stash pocket, perfect for protecting phone and keys from light rain and ocean spray.Whatever the board, whatever the adventure, you won't find a better hybrid surf bag for it.